Feeding signs give us the information about feeding ecology of animals. Feeding signs also provide information on animal distribution, habitat selection, or abundance. But, feeding signs do not necessarily directly reflect the distribution or density of animals. In addition, it is difficult to recognize the presence of endangered species only from the presence of feeding signs. Thus, we need to understand the factors and environmental conditions that influence the formation of feeding signs. Most habitat of the Asiatic black bear (Ursus thibetanus) in Japan are close to human settlements, so monitoring of bear densities will help predict bear intrusions and decrease conflict between humans and bears. Because bears live in forests in low densities, it is difficult to directly find them. Therefore as one of the estimating methods of bear densities, feeding signs may be efficient. Arboreal feeding sign (AFS) is noticeable field sign made by Asiatic black bears. When bears feed on trees, they break branches in the tree crown to acquire the fruits or leaves that are attached to the branch tips, thus broken branches are piled in the tree tops and the branches (i.e. AFS) look like birds' nests. Some local governments in Japan have used observations of AFS as indicators of bear density. However, it is unknown whether AFS are related to bear density and what kinds of factors may influence AFS formation. For example, bears climb and eat hard mast (i.e. create AFS) before the fruits are ripened and quantity of hard mast do not reach maximum value. Here, we researched the influence of fruit production of individual trees and at regional scale on the detection of arboreal feeding signs to clarify in what case bears climb to eat hard mast. For seven years, we counts the number of fruits for 374 to 481 trees each year of three dominant hard mast species (Quercus crispula, Quercus serrata, and Castanea crenata) in the Ashio-Nikko Mountains of central Japan and estimated individual tree energy values and regional mast energy values that is calculated by averaging energy values of all three species annually. We also checked for the presence or absence of AFS in these trees, and analyzed the influence of factors such as individual tree energy and regional mast energy on the detection probability of AFS. As a result, AFS were more likely in individual trees with larger mast energy values. 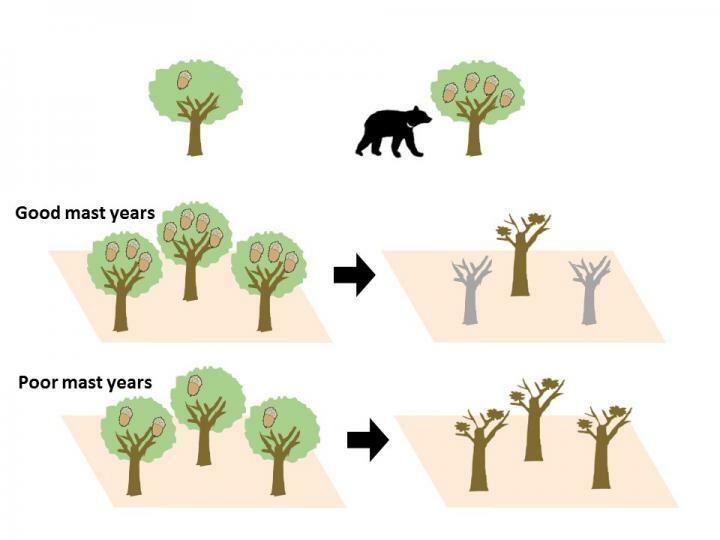 This indicates that climbing may be cost for bears, and so they climb only trees bearing many fruits to maximize feeding efficiency. Because bears cannot digest fiber efficiently, quantity may be especially important for feeding plant. Moreover, AFS were created more during poor mast years. In those years, the energy that bears can obtain when bears climb a tree is lower and there is much greater competition for the hard mast on the forest floor with other animals, such as mice. While, in good mast years, bears can eat a lot of mature hard mast without climbing, because many fruit will fall on the forest floor. There was little difference in tendency of factors among three hard mast species despite there are several kind of differences in characteristics among these species (e.g. fruit size or masting interval). Additionally, there is interaction between the factors (individual tree energy and regional mast energy). In poorer mast years, AFS is likely to be created on trees that were not selected in greater mast years. It is probably because the number of trees bearing many fruits decrease. In greater mast years, bears may not climb trees to eat fruits regardless of amount of individual tree energy. In conclusion, bears may maximize their feeding efficiency in various ways depending on fruit quantity of individual tree and across the region. In conclusion, AFS cannot be used as an indicator of bear density unless both individual tree energy and regional mast energy values are monitored. To make AFS be a reliable indicator of bear populations, comparative studies are essential at sites with similar tree species compositions to our study area and with obviously different bear densities. This work was partially supported by a grant-in-aid for JSPS Fellows (22-7646) and by JSPS KAKENHI (grant nos. JP25850103, JP25241026, JP17H00797, and JP17H05971).